Following on from my previous blog about my experience of skills coaching way back in 2011, I returned to Dalby Forest a few weeks ago and joined Steve from Chasing Trails for a refresher session. Flow through the trail, free speed, cornering techniques and negotiating technical features were the key areas. And although much of this was covered in detail in my original session, Steve soon noticed once we were out on the trail that I had developed a few bad habits here and there. I tend to do a lot of road cycling for fitness and sometimes can be off the mountain bike for a good few weeks at a time, living in East Anglia also means that I rarely encounter many technical trail features on my MTB rides unless I’ve travelled at least 100 miles towards some hills. As a result, my position on the mountain bike had morphed to closely reflect that of my road bike; weight well forward over the bars and the saddle height set somewhere near my shoulder blades. Although I somehow managed to stay on the bike through technical sections, it was probably more through luck rather than skill. So we made a few minor alterations and tried to ride the same sections again. I now had much more freedom to move around the bike and could distribute my weight more accordingly to the conditions faced on the trail. There is a compromise between manoeuvrability and being able to actually get the best power from your legs for speed, so there needs to be a trade-off between the two. It’s still frowned upon to use a dropper post in XC, but it would really give the best of both worlds and the weight of such components is dropping (no pun intended) all the time. I was also keeping my body too rigid when I approached rocky drops or other technical features and this demonstrated perfectly when I was unable to soak up the landing from a drop-off and ended up on the floor with my legs in the air. I’d consciously gone through the motions in my mind, but failed to execute it quickly enough. A second attempt with a more relaxed body and I was able to clear the drop faster and much more comfortably. We covered cornering until I was a dab hand negotiating the multiple twisting corners leading up to Medusa’s Drop, a twisty downhill section on the Dalby red route, and also looked at how the most ridden line of a trail may not always be the fastest. A lot of the skill involved in maintaining speed isn’t just about power, but constantly reading the trail ahead of you and thinking where you can conserve energy rather than pedalling through sections like a runaway freight train. Much of the training needs to be stored in the memory banks and practiced frequently over the following weeks to ensure you don’t forget and can apply it to your regular riding. I found the refresher course was a lot more beneficial than I expected it to be and it instilled new confidence in my riding and gave me a chance to find the answer to questions that have floated around my head when negotiating certain obstacles. The course was pretty much devoid of any serious climbing apart from one large pit that we rolled in and out of and a sandy incline through some tight trees near the end of the lap. Everything else was classic Thetford singletrack; tight, twisty and lots of rolling bumps between the rows of trees. Straight away I spotted how I could use the bumps to my advantage by ‘pumping’ through them and conserve my energy for later in the race. Sighting the fastest line through corners also meant I didn’t have to brake off my speed only to pedal hard to regain it again. And reading the trail way ahead rather than directly in front meant that I was ready to select the right gear to pass another rider on a sweeping corner. As I’m more of a long distance rider than a race whippet, I usually struggle to keep up the pace in these shorter course events and tend to finish in or around the top 10. So I was surprised to roll over the line in 5th place. I think a lot of this was down to applying the skills training during the race to maintain my speed and conserve energy rather than just thrashing legs and burning out early like I always used to. Next up are a couple of endurance races, a 6 followed by a 12 hour. Again an opportunity to look at ways of conserving energy and making free speed by pumping the bumps and railing the berms! 1 sponsored place is still available for a female racer. If you race XC, Endurance or Enduro & your riding skill needs to improve, get in touch! 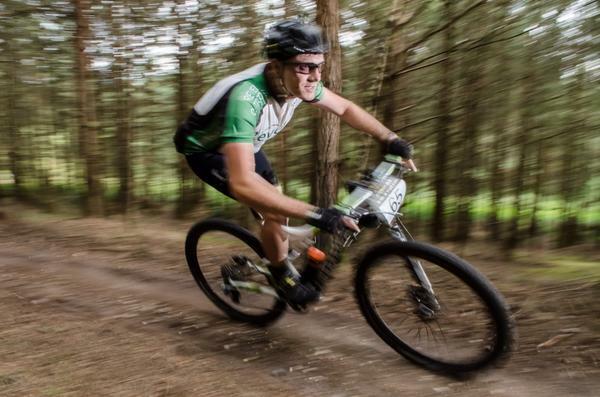 This entry was posted in 1:1, 29ers, Courses & coaching, Endurance, MTB racing, Riding, XC and tagged 1:1 MTB coaching, Chasing Trails, Dalby Forest, mountain biking, mtb, MTB skills coaching, MTB skills training, Mud, Sweat & Gears, Thetford on August 8, 2014 by steve. …the Banshee Rune can be run as a 26er or 650b (27.5er). This is good news IMO, if only because it allows a frame upgrade by swapping all the bits from your 26er whilst still giving a bit of future proofing or choice depending on how you see things. To change wheel size you just fit the relevant set of dropouts. The dropout height is also adjustable to give 3 different geometries. The one I rode was in it’s 650b guise. Many forks these days do 26 & 650b with the same fork, which is great for the indecisive! I got the chance to ride one whilst helping take groups round Dalby’s demo route for EDS Bikes. The Rune is a 160mm travel frame & was set up with a Rockshox Pike fork & Cane Creek DB Air shock at the rear. The shock had the ‘climb’ switch on it, for …climbing, but I left it open all the time & it still climbed pretty well. In fact it climbed easily as well as any 125 – 150mm frame I’ve ridden. If you’re like me, climbing well is good, but of no use whatsoever if the thing doesn’t descend! This isn’t a substitute for actual jump technique! I’m happy on the jumps, but this frame inspired extra confidence. The Pike fork was great, although the fork model is up to you. The Cane Creek air shock performed extremely well, the back end of the bike tracked the ground as you’d want it to, although part of that has to be down to the frame design as well. Although a Canadian brand, Banshee are apparently designed by a Scottish chap. He actually lives in Scotland as well & so the bikes have mud clearance. Yey! Another nice touch is that the bearings are deliberately standard sizes meaning you can use any quality bearings that are the correct size. When I look at a suspension frame, I tend to look at how a bump will work on the pivot points. On some frames a hit seems to impact a bearing more than rotate it & to my mind this will wear it out quicker. The Rune looks like the bearings won’t be stressed in this way & so I would guess they’d last well. The design seems to give a nice stiff frame laterally which helps keep you pointing where you want & other bits of good design include the stays being built from a kind of rectangular figure of eight cross section to add strength whilst keeping the weight down a bit. Not sure what the weight was but it didn’t feel heavy to lift & rode a bit lighter than it felt as well. I always feel I should be honest & say something bad if it needs saying, but in the 4 or so demo laps I did I couldn’t find anything negative! The funnest bike I’ve ridden in a long time & I want one..! This entry was posted in #26aintdead, 650b, Mountain Bike Reviews, MTB wheel sizes, MTBs and tagged #26aintdead, 160mm, 26er, 27.5, 650b, All Mountain, Banshee, Dalby Forest, Rune on July 2, 2014 by steve. This entry was posted in Uncategorized and tagged Dalby Forest, James Rush Photography, mountain biking, mtb, photos on February 16, 2012 by steve.